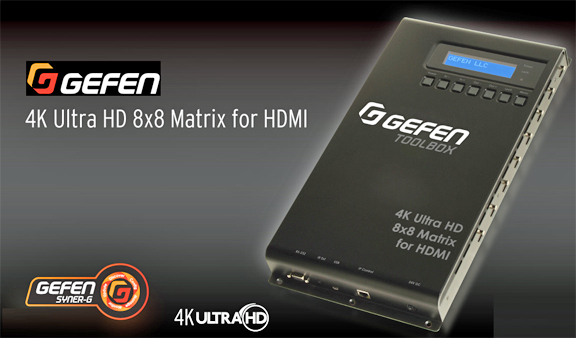 [SatNews] Gefen has announced the availability of the company's newest 4K Ultra HD matrix switcher. The Gefen ToolBox 4K Ultra HD 8x8 Matrix (GTB-HD4k2k-848-BLK) is a compact, lightweight and surface-mountable alternative to rack-mounted matrix switchers. This HDCP-compliant matrix routes eight 4K Ultra HD sources to any eight displays with HDMI inputs. Resolutions up to 4K DCI (4096x2160@24Hz), 4K Ultra HD (3860x2160@60Hz, 4:2:0 color space), 1080p full HD and 1920x1200 WUXGA are all supported. 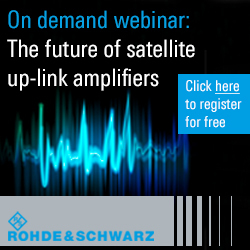 Deep color, 3D and multichannel digital audio including 7.1 channels of LPCM and HBR (High Bit Rate) formats such as Dolby®TrueHD, and DTS-HD Master Audio™ are also passed through. Gefen Syner-G™ software's Discovery and Show-Me features simplify initial IP configuration of this matrix. Each source can be routed to any display location using the front-panel push buttons or the handheld IR remote control. In addition, the matrix can be controlled via RS-232, Telnet, UDP and Gefen's intuitive and easy-to-use web server interface. An easy-to-read back-lit front panel display indicates current routing status and IP settings.